I love gin and beetroot-cured salmon and this recipe was inspired by that delicious combination. The beetroot, gin and yogurt sauce is a vibrant, shocking pink colour which screams summer, even though we ate this with the fire on and with two non-beetroot lovers who had seconds of the sauce! I served the sauce with an oven baked side of salmon, simply rubbed with lemon juice and olive oil and baked at 200 degrees for about 20 minutes. The gin is not detectable in the sauce, but adds an interesting background enhancement to the beetroot, almost taking away its usual earthy flavour and leaving the caramelised sweetness. I made the sauce two ways one with just the blended beetroot and gin and the other with yogurt. I know a lot of my readers are catering for vegans, so this can be an interesting easy no cook chutney to serve with tofu, salads and grains. I pulsed two (cooked but not pickled) beetroots, a tablespoon of honey (for vegans use golden syrup), with a few tablespoons of reduced gin (boil 1/2 cup of gin and reduce to a 1/4 cup). Blending the beetroots first and then using the gin to get to the texture that you want. 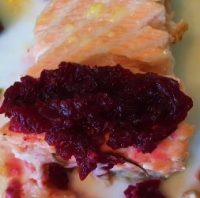 I made the beetroot into a chunky chutney consistency, which you can see on top of the salmon photo below. Then for my creamy loving sauce fans I took the sauce a step further and added the yogurt and more gin. You could add dill, chopped chives, coriander anything that matches what you are serving. I dipped a forkful of the lamb leg steak, I served alongside the salmon and it was delicious. 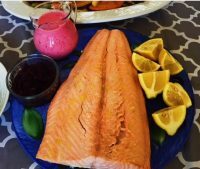 Salmon served with lemon juice, Beetroot, Gin Yogurt Sauce and Quick No Cook Beetroot Chutney. A vibrant quick to make sauce that can be used as a dressing or dip for fish, salads, grains and meat and over roasted vegetables. A fresh sweet creamy dressing that is healthy and the gin makes it interesting without being a detectable flavour. Blend till smooth and a vibrant pink sauce emerges. This makes for an easy addition to your catering or buffet table and versatile to serve to different palates. The sauce is a great talking point and I guarantee you people will love the colour and comment on the taste.